After selling homes for more than 25 years, Carole Pallister decided to take the plunge and buy a brand new house with her husband to rent out. Sales Advisor, Carole, has worked with Bovis Homes for nearly seven years and said she wishes she'd invested in property sooner. "It makes complete sense to buy a home to rent out and now we are finally doing it, I just don't know why we didn't do it sooner," says Carole. 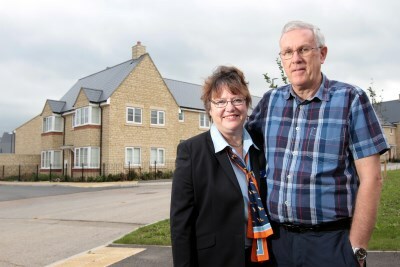 She and husband David, a Commanding Officer of the Royal Air Force Air Cadets, are buying a two-bedroom coach house at the Centurion View location at Coopers Edge in Brockworth, Gloucestershire. Carole continued: "The Turner house type was the perfect choice. It's a lovely home for a young couple or single professional. It has its own garden and sits on the edge of the development, so has lovely views of the hill behind." The home has an open-plan kitchen and living area, a utility and a back door leading to the garden from the garage. With many extras included as standard with Bovis Homes, appliances such as the hob, cooker, fridge freezer and built-in wardrobe in the master bedroom are all included in the property price. "Coopers Edge is a really popular area to live and it is easy to see why," says Carole. "Gloucester City Centre is only a five minute drive and Cheltenham is not much further. It's located right next to the M5, so Bristol is easily commutable and there's a direct route to Swindon too." Carole and David live in Gloucester, so the nearby Centurion View was the perfect location for their first rental property. The home is due to be complete by Christmas and they are hoping to find tenants at the start of the new year. "I don't know if this will be the first of many homes we'll rent out, we shall see how this one goes, but so far, so good!" she laughs. For more information about Centurion View and Imperial Place in Coopers Edge and Bovis Homes see www.bovishomes.co.uk.